Usually at this time of the year I find myself at Pike Place Market in Seattle. There’s no better way to dive into the heart of Seattle’s culinary scene than to pay a visit to Pike Place Market with over 500 merchants packed into its nine diverse acres. Seattle’s 100 plus year-old Pike Place Market is a hub of delicious and authentic cuisine and is my favourite market within driving distance. Pike Place Market provides an amazing range of culinary delights for those looking to be inspired. It was not in the cards this fall to travel to Seattle but I was inspired by a taste memory from a foodie tour with the incomparable Jan Marie Johnson, founder of Seattle Bites Food Tours. That first visit during my tour we visited nine hot spots, ranging from charming specialty mom and pop eateries, to one of a kind artisan food shops to beloved neighborhood cafes. All of the merchants we visited embrace an entrepreneurial spirit that delights locals and tourists alike. One of our last food stops was Pike Place Chowder which is hidden away on Post Alley. Nowadays every time I go to the market I am drawn to this chowder house and with a little help from the staff behind the counter, I can choose from their classic award-winning clam chowder or eight others. As a case in point on just how good it is their traditional clam chowder was inducted into the Great Chowder Cookoff of Newport Rhode Island Hall of Fame after winning the “Nation’s Best Clam Chowder” three years in a row. The chowder I remember from my childhood was little more than bland blasts of cream to my taste buds in comparison but the ones at Pike Place Chowder are well-crafted, with distinct personalities and subtle nuances. They have won awards for best chowder in the United States for good reason! !I can't say it is the best chowder I have ever had since I haven't tried chowder all over the world, but it does rank as one of the worlds best!! I am haunted by their seared scallop chowder which is a beautiful blend with fresh dill and lime juice. Imagine my elation when I discovered a recipe for their award winning seared scallop chowder on the Pike Place Chowder website! You know I just had to recreate this ultimate comfort food in my own kitchen to allow me the pleasure of travelling down memory lane. This warming scallop chowder wraps you like the culinary version of a warm blanket and curls your toes. My version of this rich, traditional chowder recipe uses tender and creamy bay scallops. The only change I made was to add less salt because I wasn't confidant my salt was comparable to what is used in the chowder house, and I added some diced celery since I had it on hand. 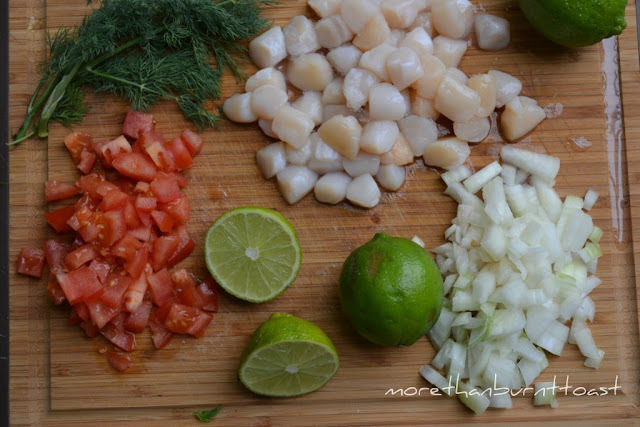 A pinch of chopped parsley or chives and paprika makes for a nice garnish on top of the scallop chowder as well. Scallop chowder is rich enough to serve as a one-dish meal, especially if accompanied by fresh biscuits or bread. 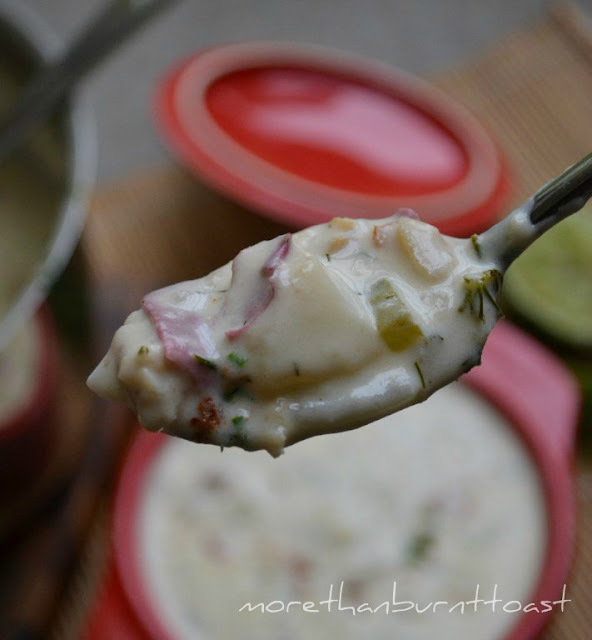 How did this chowder compare to what I have had in their store...well let's just say I can have this special treat all year round in my own kitchen!!!! With all that luscious cream I can see having this as a "shooter" for the holidays. 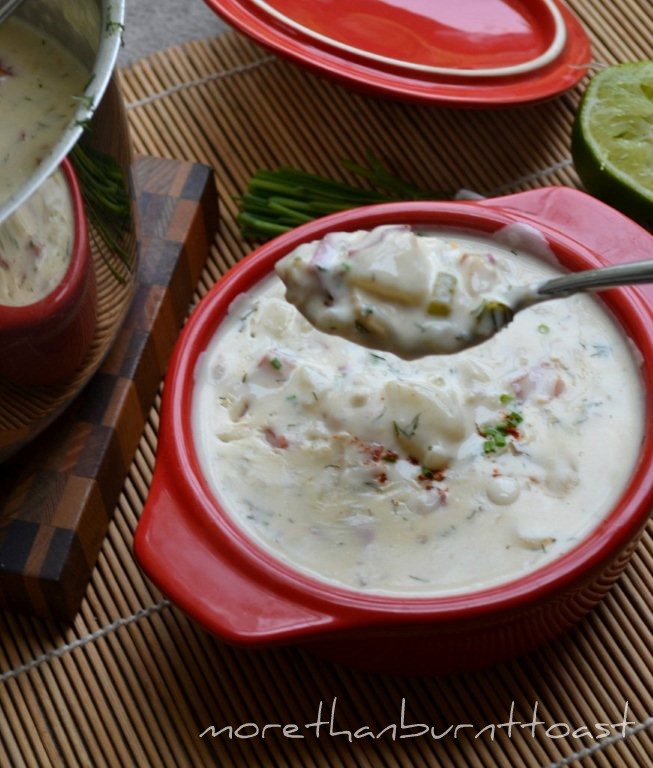 I actually fell in love with clam chowder just recently and now I can't get enough! I'm sure I'd absolutely adore thsi scallops version! Val, I could eat chowder every day. Hope you can go to Pike Place Market soon. LOVE the fact that you used scallops Val, it looks delicious! I still haven't been to Pike Place and it's still on my list of "must visits"
Great post with wonderful memories for me. We actually went to Seattle a few years ago and I still dream about it. We took the Market Pike Place Tour and enjoyed it so much. I remember that mac&cheese, the chowder those little donuts; I want to go back! That's a lovely thick chowder, Val. I was watching The Two Fat Ladies making a clam chowder the other day and wondered why it's been so long since I've made it. Now I have a new recipe to try! Easier to come by scallops than clams. Interesting to have tomatoes in it....never did that. I'm glad to hear that the recipe on their website was just as you remembered it in the restaurant. This sounds like a winner! You captured the essence of the soup all right in the spoon...bravo! That opening photo just drew me in - I wanted to steer that spoon into my MN kitchen. What a lovely break from the clams. The touch of paprika at the very end adds warmth and color. The soup is talking to me. And I'm listening. The six cups of cream throw me, but the idea of a scallop chowder excites me. I must find a way to make this but a little less fat. I am so excited about this chowder Angela! You have to try it at least once in its original award winning form. I'd serve it as shooters. It is so rich in flavour I wouldn't change a thing, but lightening a recipe at times is a good thing!! oh man! I've been craving both scallops and a creamy chowder lately. This has my mouth watering and I haven't even finished breakfast yet! Would like to visit a large and interesting market like this.This chowder sound very rich and delicious.